Hey everyone. I made a small but significant change to my blog today. Can you spot it? If you think you know what it is, please write it down in the comments below. I'm going to giveaway a bottle of Picture Polish Kryptonite to the first person who correctly identifies the change to my blog in the comments. As a distraction, here is some seriously bright neon spam. While you northern hemisphere gals are getting jiggy with those warm autumn/fall colours, the weather has made that awesome turn towards summer down under and I'm so ready for it I've pulled out some neons. Yeah, I know spring time is all about pastels and I promise I will get on board as soon as I find that damn Ulta3 Spring Pastel collection. Stupid Canberra is always so slow to get things. I was recently given the opportunity to try Orly Beach Cruiser. 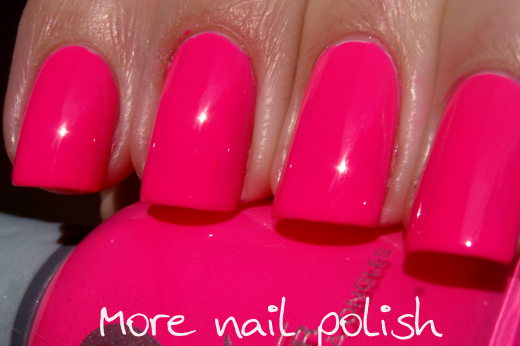 It is an amazing neon pink, which is less orange and brighter than my pictures show. This is two coats over a white base topped with Seche Vite. This was a little thin and I didn't wipe my brush properly for the first finger and I promptly flooded my cuticle, so I started again. I just ensured I was more careful loading my brush after that. 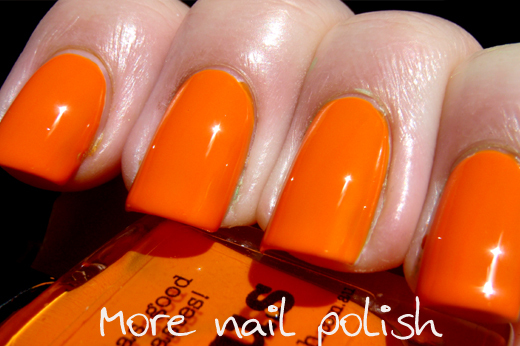 I've had this one for a while, Picture Polish Citrus. I bought it cause it was the perfect orange for my husbands baseball team. 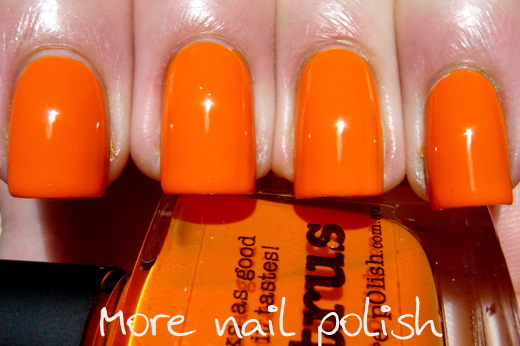 Citrus is a fabulous neon orange creme. This is two coats over a white base topped with Seche Vite. This applied beautifully. 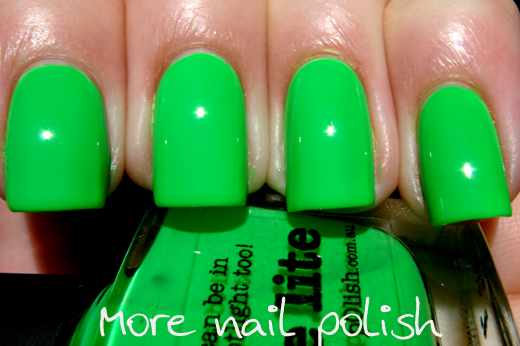 I recently received Picture Polish Lime Lite and I have to say that while isn't probably a colour I would normally wear as a full mani, it is perfect for nail art. And I don't mean it's one of those polishes that you put into your nail art pile cause it's icky, its just that its a shade that is more versatile as a nail art colour than a colour you would wear regularly. This is two coats over a white base topped with Seche Vite. Despite that comment, I'm really digging how this looks. This is another Picture Polish I recently got, crazy. Holy Crap! 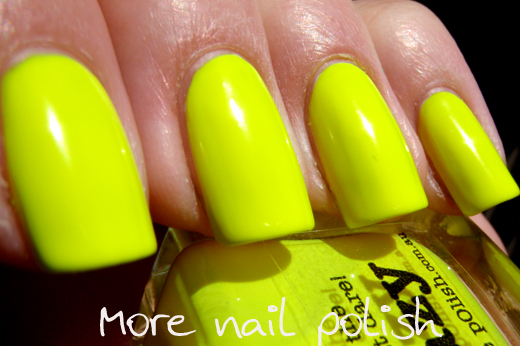 This is definitely the most neon highlighter yellow polish that I own. This is two coats over a white base topped with Seche Vite. Now get to those comments to win a bottle of Kryptonite! - And yes, I will send it internationally. Um, is it the URL? The blogspot is missing? You bought your dot com! I could have sworn your domain name used to be morenailpolish.blogspot.com.... but then I could be wrong! Yep, the only thing I had to re do was my blog roll. Well done ladies, you are all correct. And wow, you first three are all at the same time. I'll send all of you a bottle of Kryptonite. Please email me with your postal address. I have Orly Beach Cruiser, and I love it. But it does seem impossible to capture its brightness in a photo. It makes for the cutest pedicure, even better than on hands. 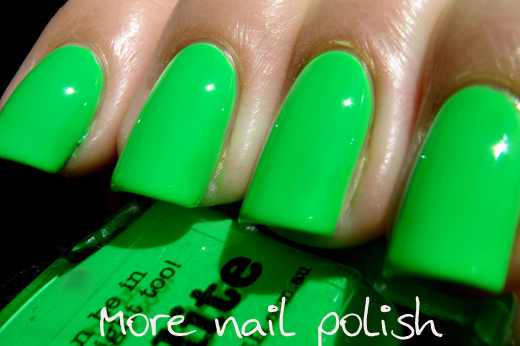 I'm really digging your swatch of Lime Lite, too. Very cool on getting your own Domain!! Congrats :) I have to admit that I looked all over, but never to the URL! lol. Wow those swathes are bright! 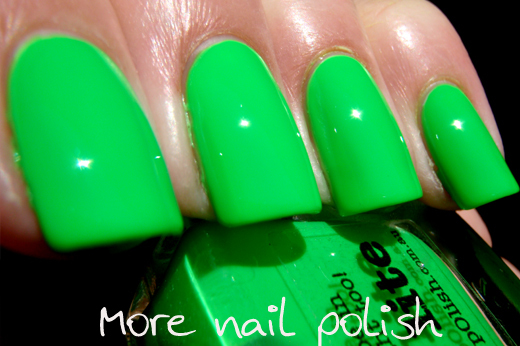 I really like the look of Lime Lite, but I rarely wear neons... and even more rarely wear neon GREENs! 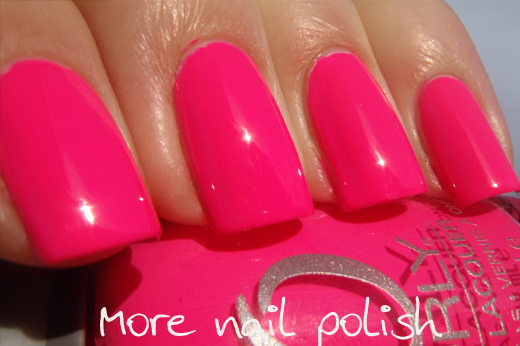 I you explaination of "nail art" polish was spot on! Congrats on the domain! 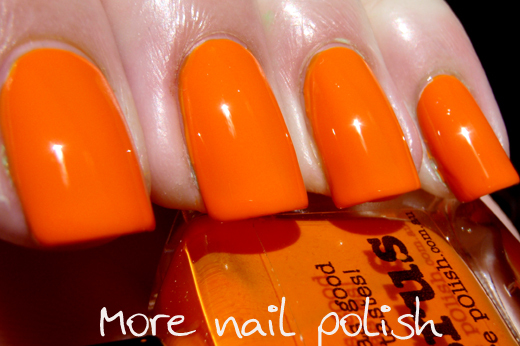 I loooove these bright colors, beautiful swatches! Grats on your domain! 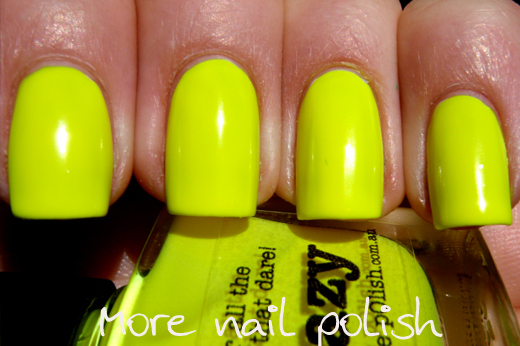 Awesome neon swatches! Congrats on the domain! I'm drooling over the neon spam! 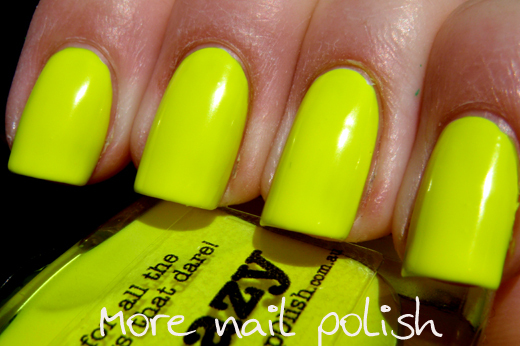 I LOVEEEEEEEE NEON! OMG I'm so jealous right now! congrats on the domain! You're a big kid now :) lol Love all the neon spam! I thought I was real clever figuring it out until I came down to comment and realised everyone else had too haha :) Congrats on the domain! Sooo... much... neonn... I LOVE IT!!! And congrats on the domain!! Congrats on the domain name! I'm recently having a bajillion problems trying to sort the same sort of thing - so congratulations for actually getting it to work. oh I jus read that others have already guessed it! hehe.. anyways congrats and happy summer! Congrats on the domain name! You are such an inspiration-- I franken because of you.